Thank you for your interest in our Roswell, GA law firm. Our personal injury lawyers in Roswell, GA are focused on helping persons that have been injured in car wrecks and tractor trailer wrecks. Unlike some other Roswell injury lawyers, we have experience, and have been responsible for several multi-million dollar settlements. Our lawyers specialize in personal injury cases, especially those occurring in the Roswell area. We have over 40 years of combined experience and we are proud to assist you in your personal injury claim. If you are not able to come to our location we will gladly meet you at your home or another location convenient to you to discuss your claim. Why Hire a Personal Injury Attorney in Roswell? Contrary to what the insurance companies typically say, they are not on your side, and will offer you the lowest payout possible for your accident. To personal injury attorneys Mark Link and Houston Smith this is simply unacceptable. Often times these accidents can cause severe, catastrophic injuries, and someone must be held accountable for your injuries. Why not have a professional, experienced, Roswell personal injury attorney on your side? If you are worried about the costs, then we have the perfect solution for you. There seems to be a misconception that hiring a personal injury law firm is expensive; however that could not be further from the truth. Our injury lawyers work on a contingency fee basis; meaning you only pay if we get you results! As you can see, there is no reason not to pick up the phone and give us a call. 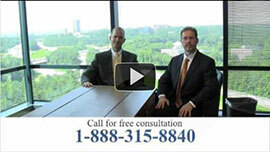 We want to help you get the settlement you deserve. Contact us today!